Through the use of digital design and manufacture, 360SDM can create customized healing abutments for optimal soft tissue healing. In the esthetic zone it essential to contour the gingiva through managing the inflammatory response, in order to create the desirable gingival architecture. Utilizing an anatomically shaped custom-healing abutment not only sets the tone for a better restoration, it also simplifies the restorative process, allowing for easier and complete seating of the restorative components. Custom healing abutments/provisionals provide the best option to standard healing abutments; these abutments are milled from a PMMA disc, and can be modified chairside if needed. 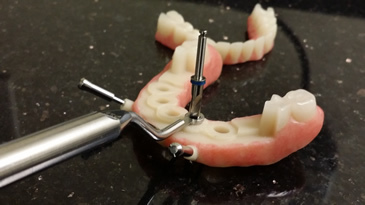 360SDM In conjunction with V2R Biomedical can now concurrently deliver a proprietary split (bite registration) surgical guide and a custom temporary healing prosthesis at the time of surgery. 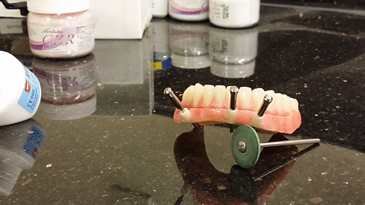 Utilizing a nano ceramic material for the guide manufacture, an immediate temporary (healing prosthesis/denture) can be luted and refined chairside. In recent years, implant systems have increasingly improved to a fully integrated minimally invasive guided surgery option. Treatment planning software in conjunction with CBCT imaging, allows for the virtual placement of implants. This virtual design has lead the way for developing an accurate all in one surgical guide healing prosthesis. 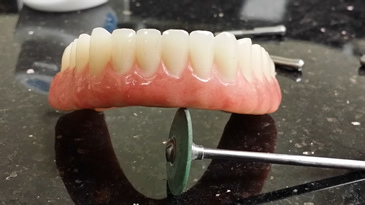 This digital workflow of design and manufacture leads to the complementary custom restorative components. These customized components can be delivered at time of surgery, leading to a quicker clinical experience for the doctor and less chair time for the patient. As a result, soft tissue architecture is developed with less inflammation, faster healing and predictable restorative results.